Eager anticipation doesn’t even begin to cover how excited I was about going to Taiwan. The only thing about this trip is that it also meant my time in Hong Kong was quickly drawing to a close. But better not to dwell on that fact. Pack your bags for Taipei! I had a lot of catching up to do in this blog post, but it will be well worth it. I had the most amazing time since the post prior! 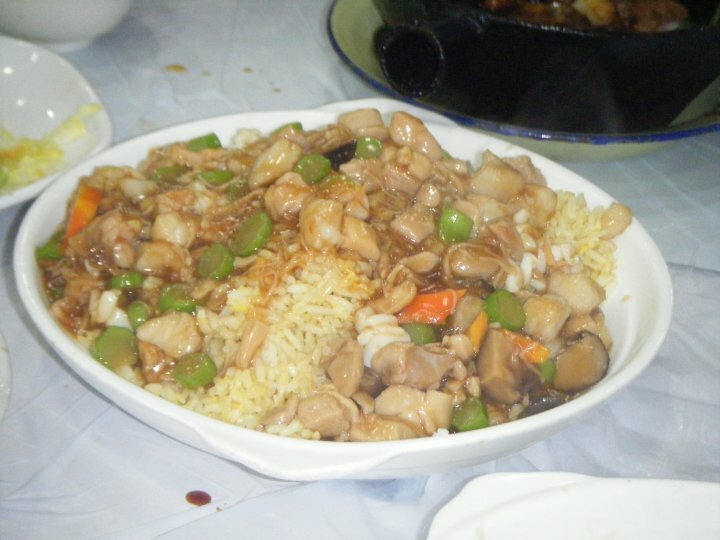 Delicious rice dish. Even on its own – this would have been a perfect dinner. After dinner, we went to a nearby mall and had ice cream; I got black sesame flavor, which was also really unique and tasty, and then we hung around outside for a while before giving all three of them a “thank-you” card for all the kindness and wonderful foods and sights they’d shown us in Hong Kong. The three of them were so great, and I feel so lucky to have been “adopted” by Jen and Ilaria’s buddies, I saw a side of Hong Kong I wouldn’t have experienced otherwise. Thursday was spent finishing my last classes (happy and bittersweet at the same time), and then I went and met a friend I’d made in LKF for dinner in Kowloon Tong. His name was Nish, and we’d met through a mutual friend about three weeks prior – he was studying at Hong Kong Baptist University for the semester. HKBU got done with their classes and finals a couple of weeks before HKUST and since Nish was leaving for Malaysia (his next study abroad destination, lucky guy) on May 17th (the day before I was due to return from Taiwan) we wanted to have dinner together before he left for good. Our final ice cream goodbye with our Hong Kong buddies. So I met him at Kowloon Tong at 7, and he took me to a local Thai restaurant he knew near HKBU for dinner with excellent food. We had pineapple fried rice with pork floss, fried broccoli with seafood, and minced chicken and veggies that you wrapped in lettuce leaves. Then he showed me the campus of HKBU, we hung out for a bit longer, said, “Adios,” and back to my campus I went. He had one more final the following morning he needed to study for and I had an early taxi ride to the airport. I really wish we’d had a chance to meet earlier in the semester, I had such a fun time whenever I ran into him and his friends in LKF, but we barely had to time to get better acquainted. Friday morning I got up at the crack of 7:30 (I know, it seemed so early at the time) to meet with my Taiwan teammates and go to the Hong Kong airport at 8:30 We all arrived in the atrium (except Merelyn, who overslept, and had to take the bus to the airport later) and hopped in a specially arranged cab. We all made our flight to Taipei (even Merelyn) and arrived in Taiwan around 3 in the afternoon. Even though the flight was only an hour and a half, they still served us food! I still couldn’t believe it; I was so disappointed in all of the American airlines at this point – and I didn’t want to go back on United Airlines period (especially after the way my study abroad began: being stranded in Chicago overnight). But I digress, we arrived in Taipei, took a bus to the MRT station near our hostel (how similar to the MTR in HK), got out of the station… and saw a bubble tea place. My world was instantly brighter. We quickly adopted the moniker “Team Buns” during our time in Taiwan for obvious reasons. Now if you’re not familiar with bubble tea, I will explain. It is the most delicious drink made of tea, milk, lots of sugar, and black, chewy tapioca balls. And Taiwan invented it, therefore, Taiwan had bubble tea places everywhere and they were all DELICIOUS! So of course we stopped for bubble tea en route to the hostel. Simply fabulous – my first impressions of Taiwan were much better than my first impressions of mainland China, I can tell you. The hostel we were in called, “Camels’ Oasis” was fine. It was clean, well located, and aside from having only one bathroom, served our purposes well. 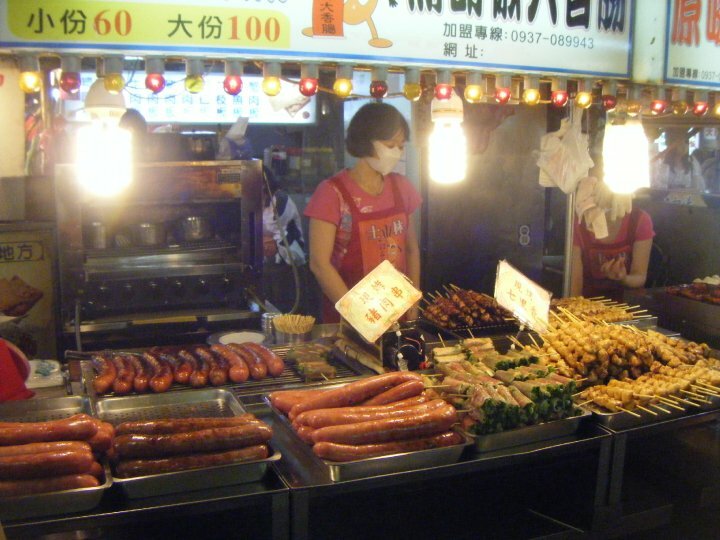 After putting down our things and getting a little more settled in, we headed out to explore the famous “Shilin Night Market.” All I can tell you about Shilin is OH MY GIDDY-GOD! You have never seen as much street food as we saw there! We entered what was essentially a giant, year round carnival with games and rides and food! Oh the food! There were vendors selling everything: fruit on a stick, meat on a stick, deep-fried squid on a stick, buns, dumplings, deep-fried chicken (which is another famed Taiwanese dish), fried corn on the cob, yams, oyster omelets, noodles, smoothies, little pizzas cooked in the shape of ice cream cones for easy consumption while walking, stinky tofu (!) – The list was just endless, I tell you! 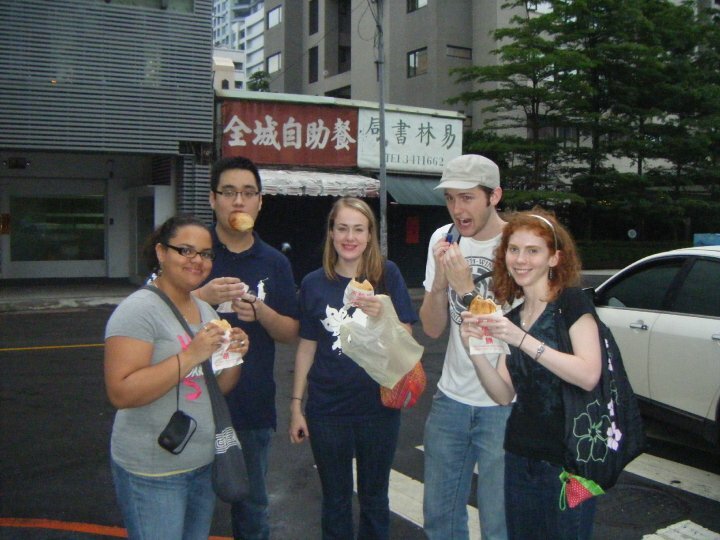 Being the adventurous (and gluttonous) travelers we were, we set to work tasting everything we could. 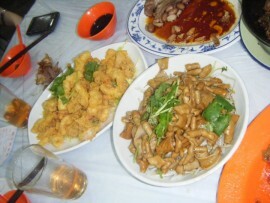 A fraction of the food available at Shilin. Where do I even start? 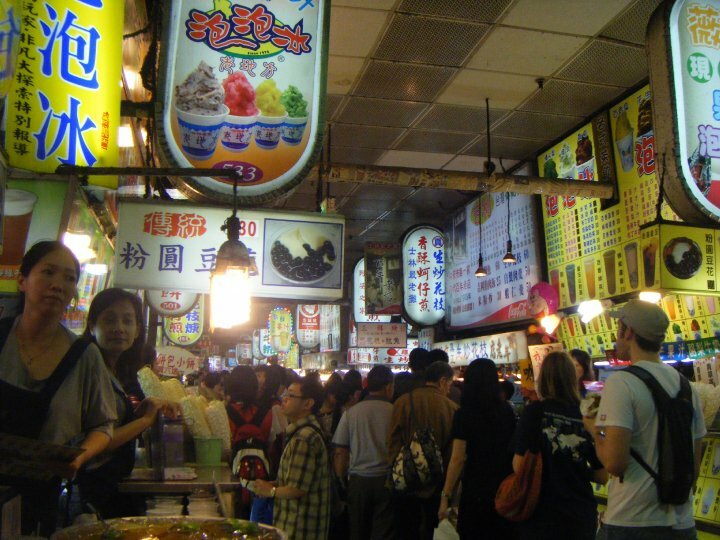 This is actually an inside shot of the food booths at Shilin. Talk about crowded! Oh, I forgot to tell you, the US dollar is equal to 31.5 Taiwanese dollars, so not only was everything delicious but it was also as cheap as could be! Awesome! So we filled the void in our tummies, and then wandered into Shilin Night Market proper where they were selling everything touristy – clothing, key chains, doohickeys, tchotchkys, etc. Nothing too exciting or different from what we’d seen in other Asian countries and walking down the crowded street with my 3,000 best friends wasn’t exactly the most fun I’d ever had. Eventually, we got tired of wandering around (it had been a long day) and returned to our hostel’s MRT stop and went to a nearby bar. The bar was fun; very American with license plates from Nevada and the feel of a very friendly, neighborhood-y place. We ended up staying there until 2 in the morning talking and getting to know each other better – of the four people I went with, I only knew one of the girls pretty well, Janet. Lucas, Cameron, and Merelyn I was only vaguely acquainted with up until that trip. We had a very successful first day in Taiwan, though. I already loved the city. 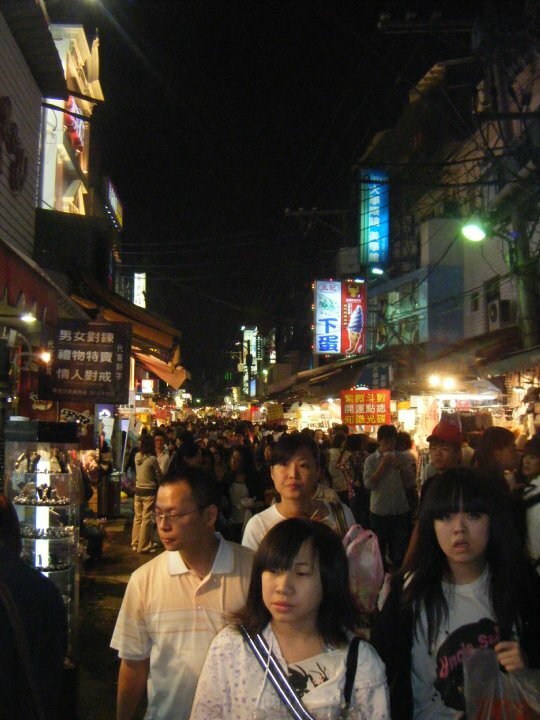 The crowded carnival of Shilin. Totally nuts and so great! Stay tuned for my next post, when we really dove into Taiwan. Here’s one teaser: a museum dedicated exclusively to miniatures… oh, and some stunning waterfalls and hot springs too. There’s that. Anyway, don’t miss it! This entry was posted in Asia, Hong Kong, Taiwan and tagged Asia, Bubble Tea, Chui Chow, HKUST, Hong Kong, Shilin, Taipei, Taiwan, Travels on May 2, 2014 by Paige N..